$13 drop-in. OR, register and pay for the Winter Session on – or before – January 1, and the New Year’s Day class is FREE for you! $74 – 8-Week Session, 8 Classes. Take ANY 8 of my classes during the session, that includes Monday, Wednesday, or the Saturday classes. Any 8 classes during the 8 weeks — you choose the ones that work best for you. $13 – drop-in to any class. If weather or whatever creates a cancellation, we’ll extend the session accordingly. That stays the same. And, as always, because all session fees offer such a big discount over the drop-in class cost, there is no carry-over of missed classes. And, now you’ll have even more opportunities to get your classes in! Start your 2019 with inspiration, intention, and peace. SUNDAY, JANUARY 6, 2019, 4:00 p.m. Whether you are a beginner or have your own mindfulness practice, you will find there is a joyful and refreshing energy that comes when we practice together. What a perfect thing to do together as we start a fresh new year! This one-hour practice includes gentle stretching, followed by guided and silent meditation in an encouraging and nurturing environment. Pillows, bolsters, and chairs are provided. Or, bring your own favorite sitting pillow. Our meditation practices are offered on a “donation” basis. Your gift supports expenses at the studio. Thank you for your kindness. New Year’s Resolutions just seem so uninspiring, so unpleasant, so “un-fun.” They sound like something you “have” to do … not something you “want” to do. So, don’t make Yoga an “resolution” to yourself. Instead, make Yoga a promise to yourself. 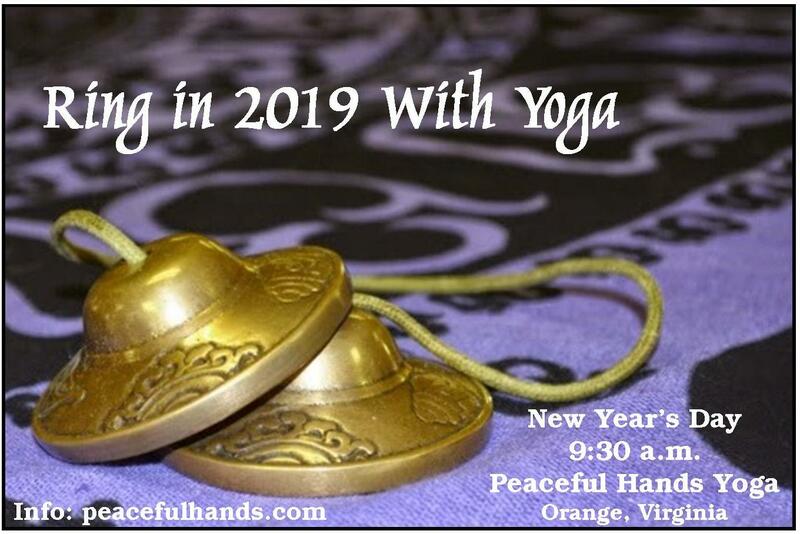 I hope these new opportunities inspire you to make YOU a priority in 2019 … starting with a commitment to good health through Yoga. More info, including directions to the studio, are here.